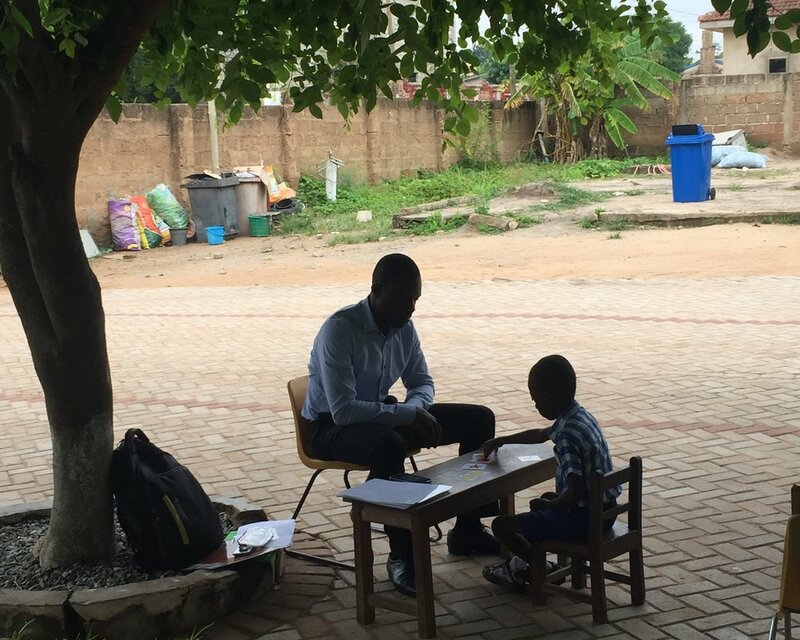 Enumerator (Maxwell) assesses student using IDELA at Bright School Complex, Accra, Ghana. Universal access to quality education (UN Sustainable Development Goal #4) remains a substantial challenge worldwide, in particular in Sub-Saharan Africa. In Ghana and Uganda, private schools take on an increasingly important role. However, the quality of the education received by children in private schools serving low-income communities is often low. Schools often lack the required monetary resources and human capital to deliver quality education. Investments in school infrastructure, leadership capacity, and teacher skills have the potential to improve education quality and impact student learning. Opportunity International’s EduFinance program aims to foster inclusive learning environments by offering school proprietors, teachers, parents, and students a range of sustainable, scalable services. Opportunity International’s EduFinance program is a multifaceted program that a) works with microfinance banks to provide loans to low-income private, community schools, and b) works with these schools to improve the quality of education through other means (EduQuality). EduQuality is a component of EduFinance. The EduQuality program aims to build the capacity of administrators and teachers within schools through trainings, to improve school management by helping schools come up with school development plans, and to encourage platforms for sharing best practices. Opportunity International wanted to better understand the impact of its EduQuality program and to explore ways in which the program could be improved. IDinsight led a process evaluation of the EduQuality program in order to make recommendations on how the program implementation could be improved. Furthermore, IDinsight conducted quantitative measurements and qualitative interviews to uncover early signs of impact on childhood learnings, student and teacher attitudes, collaboration between and within schools in the program, and proprietor and teacher knowledge and skills. Based on IDinsight findings, Opportunity International is currently strengthening the implementation of its EduQuality program. For example, Opportunity International is seeking ways to involve teachers in school decision-making. Opportunity International is also designing teacher trainings that are more collaborative and solution-oriented.